One night, a Delta twin-engine puddle jumper was flying somewhere above New Jersey. There were five people on board: the pilot, Michael Jordan, Bill Gates, the Dalai Lama, and a hippie. Suddenly, an illegal oxygen generator exploded loudly in the luggage compartment, and the passenger cabin began to fill with smoke. The door of the pilot's cabin opened, and the pilot burst into the compartment. "Gentlemen," he began, "I have good news and bad news. The bad news is that we're about to crash in New Jersey. The good news is that there are four parachutes, and I have one of them!" With that, the pilot threw open the door and jumped from the plane. The Dalai Lama and the hippie looked at one another. 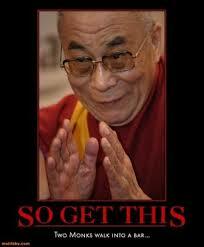 Finally, the Dali Lama spoke. "My son," he said, "I have lived a satisfying life and have known the bliss of True Enlightenment. You have your life ahead of you, you take a parachute, and I will go down with the plane." The hippie smiled slowly and said, "Hey, don't worry, pop! The world's smartest man just jumped out wearing my backpack."